Theatricum Botanicum will present two of Shakespeare’s best-loved comedies for its 40th Anniversary Season: The Taming of the Shrew, directed by Ellen Geer, opens on Saturday, June 1; one day later, on Sunday, June 2, Theatricum’s signature production of A Midsummer Night’s Dream, co-directed by Willow Geer and Melora Marshall, hits the boards. Both plays will continue in repertory throughout the summer as Theatricum sets out to celebrate 40 years of theater, music, poetry and performance in the Topanga woods. The Taming of the Shrew is a rowdy romp that stands as one of Shakespeare’s sharpest and funniest scripts. No suitor can win lovely Bianca until her older sister, “Katherine the Cursed,” is married off. Can Petruchio subdue Kate’s temper and win her bountiful dowry, or will she continue her shrewish ways? There’s only one way to find out. The cast stars Willow Geer as Kate and Aaron Hendry as Petruchio, with Christine Breihan as Bianca; Bill Gunther as Gremio, John Maidman as Lucentio; Melora Marshall as Grumio; Gerald C. Rivers as Christopher Sly; Franc Ross as Baptista; and Jeff Wiesen as Tranio. On Friday, September 6 and Friday, September 13, audiences will have the chance to enjoy a pre-performance British “Pub Grub” dinner in the theater’s adjacent gardens (separate admission, or combo packages available). The afternoon following opening night of Shrew, cast members Willow Geer and Melora Marshall will be back on stage for a matinee performance of A Midsummer Night’s Dream, this time in the roles of Helena and Titania, respectively. 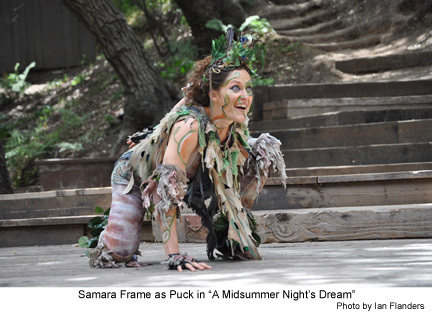 Also in the cast are Samara Frame and Will Hickman sharing the role of Puck, Katherine Griffith as Bottom and Michael McFall as Oberon, Once again, the most magical outdoor setting in Los Angeles will be transformed into an enchanted fairy forest inhabited by lovers both fairy and human. In a world of wonder and romance, comical misunderstandings and the pain of unrequited love are resolved and all is reconciled through midsummer night revelries and the enduring power of nature. Mediterranean buffet dinners with a costumed cast of fairies in attendance, will take place every Thursday in August at 6:30 pm in the theater’s adjacent gardens, followed by an 8 pm performance of A Midsummer Night’s Dream (separate admission, or combo packages available). Will Geer’s Theatricum Botanicum is located at 1419 North Topanga Canyon Blvd. in Topanga, midway between Malibu and the San Fernando Valley. For a complete schedule of performances and to purchase tickets, call 310-455-3723 or visit www.theatricum.com.